More than just a sneak peek! 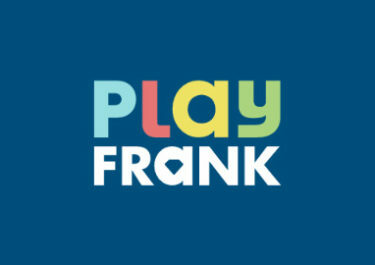 All details about the latest Netent creation! It has been announced some weeks ago but to this day we had little information about the next Netent slot. 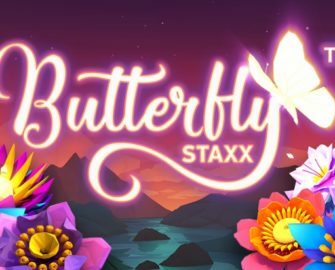 Ready for release on 21st June 2017, Butterfly Staxx™ will take players into a world of tropical flowers and fluttering butterflies. 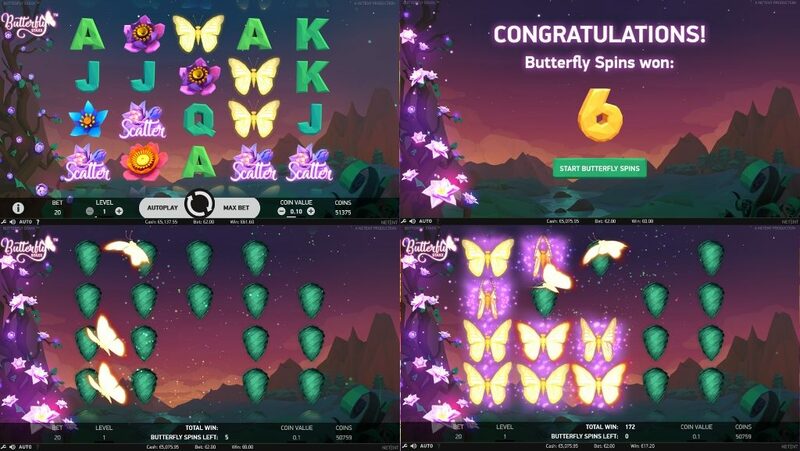 Feast your eyes on sparkling butterflies and let all the flowers bloom for you when you hit the Free Spins bonus round or activate the Butterfly Re-Spins, a new pay mechanism that is a first on a Netent game, wonderful to watch, I might add. Butterfly Staxx™ is a 5-reel, 4-row, 40-pay lines (fixed) video slot, featuring Free Spins, Wild substitutions, Stacked symbols and Butterfly Re-spins. Bet levels and coin values range from 1 – 10 and 0.01 – 2.00 allowing for bet sizes between $0.20 – $400. Maximum pay on a single pay line is 600 coins or $1,200. 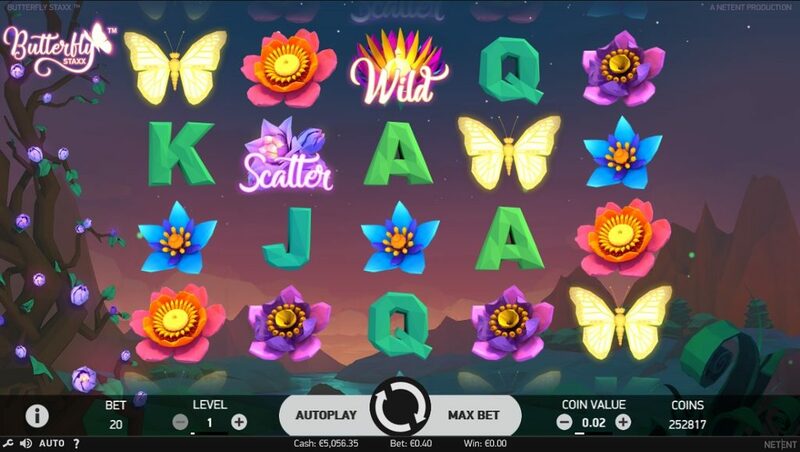 One new pay mechanism that Netent has introduced on this slot is the Butterfly Re-Spins feature which activates when a full stack of Butterfly symbols lands on any reel. TRTP is stated with 96.80% for this low variance slot in HTML5 format that will be available for play on desktop, mobile or tablet across all OS platforms. Pay symbols can appear stacked covering a number of positions on a reel. Low pays are J’s – A’s while medium symbols are a range of flowers in blue, purple and red colors and top symbol is a golden butterfly. Wild symbol is a blossoming flower, substituting for all symbols except scatters. A flower arrangement with the word “Scatter” across it is the scatter symbol that can appear on any reel. A full stack of Butterflies will activate the Re-Spin Feature, moving all Butterfly symbols to the leftmost position on the same row. 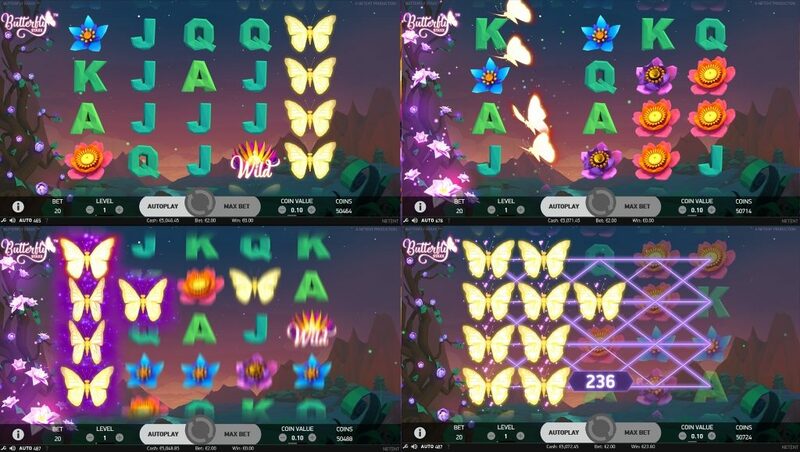 Any further Butterfly symbols landing on the Re-Spin will move as well to the left until no further symbols land on the reels or the screen is complete with Butterfly symbols. Our first few hundred test spins showed that the feature activated frequently with about 2/3’s ending in a win, while the reminder had no further butterflies added in the re-spin. The highest win we hit was roughly 54x bet, although the maximum is at 600x bet with a full screen of butterflies. 3, 4 or 5 Scatters landing on a spin anywhere on the reels will award 5, 6 or 7 Free Spins. During the Butterfly Free Spins only Cocoon symbols can land on the reels. Any active Cocoons will transform into Butterfly symbols which then fly to the leftmost position, just like in the Re-Spin feature, and will remain sticky until the end of the bonus round. Wins are paid on each spin that has at least two butterflies on a pay line. At first glance Butterfly Staxx™ seems well-designed with decent graphics and animations as well as a relaxing soundtrack. The new pay mechanism is wonderful to watch and promises to have some surprise mega or even super mega wins in store when the reels are getting covered with butterflies during the feature. However, the line pays look very low at just 15x bet for a 5OAK top symbol, and will only make a significant difference if it happens on multiple lines, preferably on all 40 pay lines to produce the maximum payout for this slot of 600x bet. Whether it will become a players’ favorite remains to be seen though since it is low variance with medium win potential and not out-of-this-world animations. Only time will tell when it will be released on 21st June 2107. 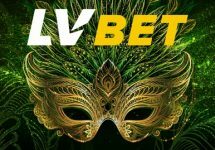 BetVictor – £20,000 Netent Giveaway!